The primary goal of the noodles library is to ease the construction and execution of computational workflows using the Python language. This library is meant for scientists who want to perform complex compute-intensive tasks on parallel/distributed infrastructures in a readable, scalable and sustainable/reproducible? manner. A workflow is commonly modelled as a directed acyclic graph (DAG or simply graph) in which the computations are represented as nodes whereas the dependencies between them are represented as directed edges (indicating data transport). At this point it is good to know what the module noodles.tutorial looks like. It looks very simple. However, you should be aware of what happens behind the curtains, to understand the limitations of this approach. """Adding up numbers! (is very uplifting)"""
The @schedule decorators takes care that the functions actually return promises instead of values. Such a PromisedObject is a placeholder for the expected result. It stores the workflow graph that is needed to compute the promise. When another schedule-decorated function is called with a promise, the graphs of the dependencies are merged to create a new workflow graph. The promised object can be of any type and can be used as a normal object. You access attributes and functions of the object that is promised as you normally would. Be aware, however, that it is important to program in a functional way, so changing the attributes of a promised object is not a good idea. Instead, return a copy of the object with the changed values. Using the Noodles approach it becomes very easy to paralellise computations. Let’s look at a second example. This time the workflow graph will look a bit more complicated. The workflow graph of the second example. 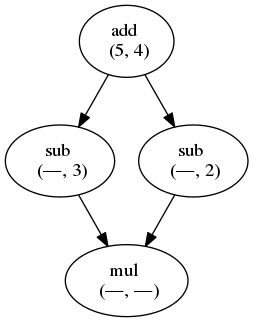 By unpacking the list (by doing gather(*w)) in the call to gather, each item in w becomes a dependency of the gather node in this workflow, as we can see in the figure above. To make use of the parallelism in this workflow, we run it with run_parallel(). This runner function creates a specified number of threads, each taking jobs from the Noodles scheduler and returning results. Noodles ships with a few ready-made functions that run the workflow for you, depending on the amount of work that needs to be done. Runs your workflow in the same thread as the caller. This function is mainly for testing. When running workflows you almost always want to use one of the other functions. Runs your workflow in parallel using any number of threads. Usually, specifying the number of cores in your CPU will give optimal performance for this runner. If you are very very certain that your workflow will never need to scale to cluster-computing, this runner is more lenient on the kinds of Python that is supported, because function arguments are not converted to and from JSON. Think of nested functions, lambda forms, generators, etc. Starts a second process to run jobs. This is usefull for testing the JSON compatability of your workflow on your own machine. Xenon is a Java library offering a uniform interface to all manners of job schedulers. Running a job on your local machine is as easy as submitting it to SLURM or Torque on your groceries supercomputer. To talk to Xenon from Python we use pyxenon. Using the Xenon runner, there are two modes of operation: batch and online. In online mode, jobs are streamed to the worker and results read back. If your laptop crashes while an online computation is running, that is to say, the connection is broken, the worker dies and you may lose results. Getting the online mode to be more robust is one of the aims for upcomming releases. The Xenon runner needs a way to setup the virtualenv on the remote side, so a worker script needs to be specified. We have included a bash-script worker.sh that should work in the simplest cases. # start the worker with the rest of the arguments. # stderr is written to a file. If you need to setup some more aspects of the environment, load modules, set variables etc., modify this script and put it in the directory where you want to run the jobs. Specify this directory in the Python script. # passwords ending up as ASCII in your source files. # Configure Xenon to access your favourite super computer. # Specify how to submit jobs. We may have a situation where a workflow consists of some very heavy compute jobs and a lot of smaller jobs that do some bookkeeping. If we were to schedule all the menial jobs to a SLURM queue we actually slow down the computation through the overhead of job submission. The Noodles cook may provide the schedule functions with hints on the type of job the function represents. Depending on these hints we may dispatch the job to a remote worker or keep it on the local machine. We provide an example on how to use the hybrid worker in the source. If you really need to, it is not too complicated to develop your own job runner based on some of these examples. Elsewhere in this documentation we elaborate on the architecture and interaction between runners and the scheduler, see: The Noodles Scheduler.